It’s only day one (really day ½ because we didn’t land until around noon) but we’ve already hit a lot of the high points! We landed, headed to the hotel to check in and drop our bags off and then we were off to explore! Aside from the (surprisingly good, or maybe I was just that hungry) Wheat Thins that we were given on our flight, we were running on an empty stomach, so our first mission was to find lunch. We walked a couple blocks from our hotel to a hole-in-the-wall coffee and sandwich shop to give it a shot. And it was the Best. Sandwich. Ever. I got a bacon and gorgonzola panini and it was delightful. After we ate, we walked to Pike Place Market. We didn’t rent a car, so we are relying on our little feet to get us across this great city over the next few days. Here’s to hoping that the weather stays as nice as it was today and that my shoes are still this comfortable tomorrow. We quickly saw so much of the city, because we walked through the heart of Seattle to get to the Market. Arriving at Pike Place Market was just as cliche as I was expecting. We turned the corner and were greeted by a huge “Public Market” sign. We wandered around the streets before we headed into the Market. 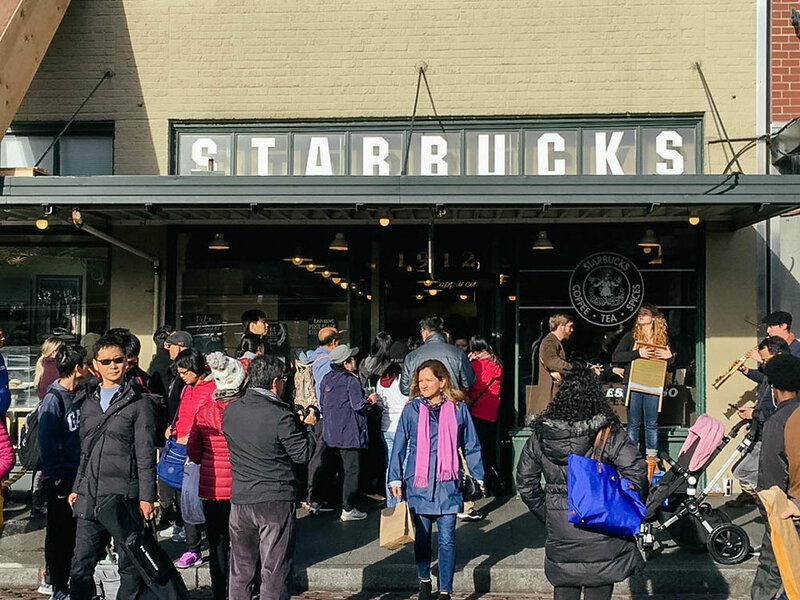 We walked past the original Starbucks, took pictures by the Seattle Great Wheel, peeked our heads in the famous mom and pop restaurants along the street and then braved the crowds and dove into the Market. I was surprised by the amount of craft/handmade goods that there were. I was expecting more foodie vendors, but I want to say that there might have been more craft vendors than food vendors. We grabbed some chocolate pasta- a Pike Place Market staple. 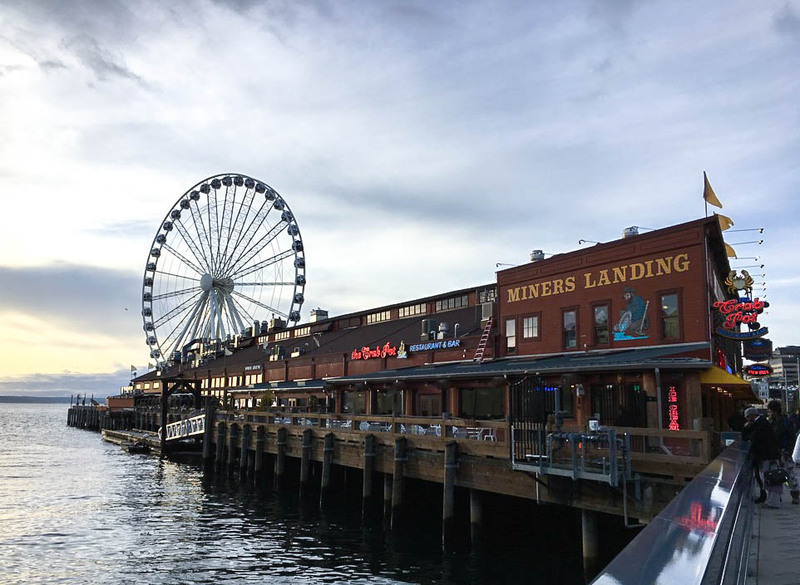 We wandered around downtown, trying to get a feel for the area and figure out what we wanted to add to our list of things to do. We were walking up and down the pier when Copperworks Distillery caught David’s eye. They were offering tours, so we thought we would see what it was like. We walked in as the last tour of the night was starting, so the nice bartender offered to give us a “tour” from the bar while David sampled their whiskey. We had dinner during sunset on the pier and then headed back to the hotel. We were exhausted and knew that we would be asleep as soon as we stepped foot in the room. We weren’t wrong.